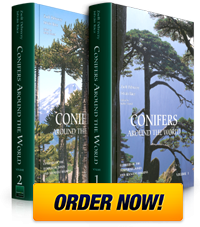 There is a wealth of conifers in Mexico and adjacent regions in Central America – primarily in the long mountain ranges of the eastern and western Sierras, as well as the Sierra Volcánica Transversal, then in the mountains continuing to the south. The diversity is marked by ~130 taxa, with half of these belonging to the pines, mostly endemic to the region. There are 81 range maps, 27 conifer habitat photos and descriptions, and 35 full-page species profiles in this chapter (see samples below).